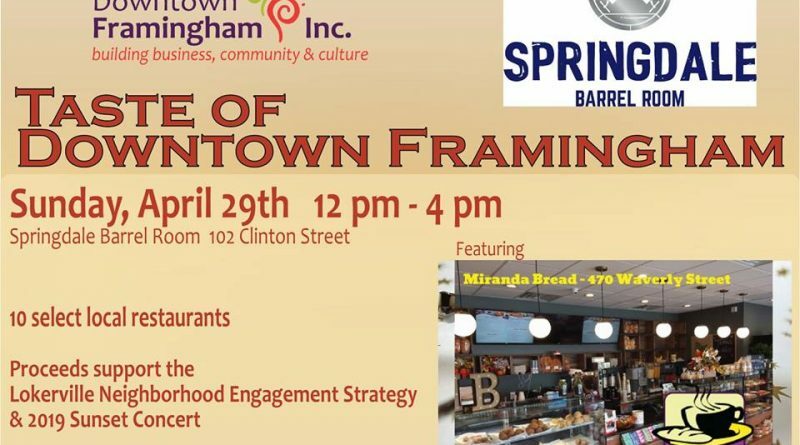 FRAMINGHAM – If you want to experience the artisan taste of an authentic Brazilian bakery, visit Miranda Bread at the Taste of Downtown Framingham on Sunday, April 29. The event runs from 12 pm to 4 pm at the Springdale Barrel Room, located at 102 Clinton Street where on-site parking is available. At the Taste of Downtown Framingham, try their flan, chicken croquette, beef croquette, cheese bread, and orange cake. Five lucky attendees will each win $20 gift cards to Miranda Bread. To drive foot traffic back to the participating restaurants, Taste attendees will also receive a special Spring Restaurant Week book featuring a special at Miranda Bread valid from April 30 through May 6. When you become a customer, Miranda Bread welcomes you into their family. Meet owner Ernando Castro, who was the very first restaurateur to register for the Taste Downtown Framingham. After achieving success in Worcester and Stoughton, Castro opened Miranda Bread in Framingham across from the MBTA station in March 2017. If you want to see the power of transit-oriented development, stop by Miranda Bread at 470 Waverly Street and observe all the local residents along with commuter rail passengers who arrive at dawn for coffee and breakfast bites. Teleworkers often stop in to relax in this cozy setting that includes free wifi.